Stocking home goods, accessories, and furniture by close to 400 artisans and makers, the selection at Portland-based retailer Beam & Anchor is equal doses global and homegrown. 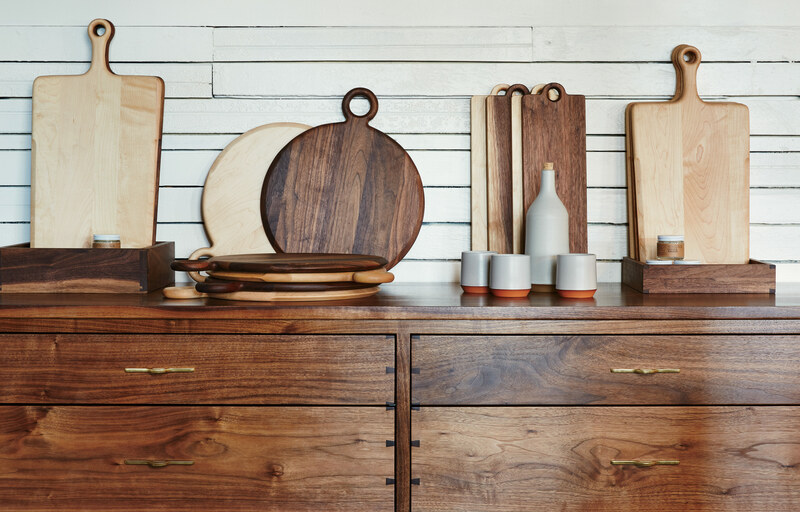 Among its local wares are cutting boards and a credenza by newly launched Marrow Goods, cofounded by Ryan Fitzpatrick and one of the store’s proprietors, Robert Rahm; the serving set is by ceramics workshop Mazama Wares. A 7,000-square-foot warehouse in the city’s industrial North Portland neighborhood plays hostto Beam & Anchor and its equally expansive inventory of goods. The large-yet-curated selection includes an Italian-designed Ellepi stapler, Parveen scissors from India, made from brass and stainless steel, and vintage alpaca blankets from Sackcloth & Ashes. In addition to the retail space, cofounders Robert and Jocelyn Rahm run an incubator-like workshop for local makers on the upper floor, from which most of the store’s furniture is sourced. Train tracks run adjacent to Beam & Anchor, adding to its romantic charm. Initially focused on wares by local artisans and designers, the Rahms’ inventory now spans the globe, with items including handwoven baskets from Africa. Leaving their respective jobs in wilderness therapy and educational consulting behind, husband-and-wife duo Robert and Jocelyn Rahm opened Beam & Anchor in Portland, Oregon, in 2011—the culmination of a longtime pipe dream turned reality. How did the store begin? Jocelyn: My husband and I had been working in very different fields, and were both experiencing one of those moments in life where you ask yourself: “Is this it?” We’d long talked about creating a community space for like-minded creatives. It’s not a revolutionary idea, but we wanted to foster cross-disciplinary collaboration, so we invited local artisans and designers to work together in the same space. There’s no shortage of folks in Portland who are making really amazing work. It just made sense to have a showroom of everything that was being made upstairs in the studio. Robert started producing furniture, and has always been obsessed with design; he probably checks about 50 blogs each morning. The passion just sort of merged between the two of us. How has the store concept evolved since its launch? Initially, we had planned to keep our focus local, but then that felt way too limiting, from a design perspective, so the retail space became a larger conversation about showcasing lifestyle goods, furniture, and objects that have a powerful resonance—a compelling, considered process that was put into the creation of it. What kinds of designers and makers are represented at the space? Most of the furniture here comes from upstairs, but we have about 400 vendors from all over. We’re big lovers of ceramics, which do really well. There’s a certain texture and humanity to the shop: We try to procure products with an emphasis on the story and narrative of the maker, how the object was made, and why it’s worth living with. How has the role of brick-and-mortar shops changed in the age of Amazon? There’s a deeper inclination to make sure that money is spent on something that our customer base really cares about. Obviously, it’s a very particular demographic, but that’s kind of the main philosophy. What’s the local neighborhood like? It’s in this weird little industrial zone that’s adjacent to two well-trafficked parts of town: the Mississippi District to the north, and just across the bridge, the Pearl District downtown to the west. But it’s still a bit of a destination—you sort of need to have the intention to come here.